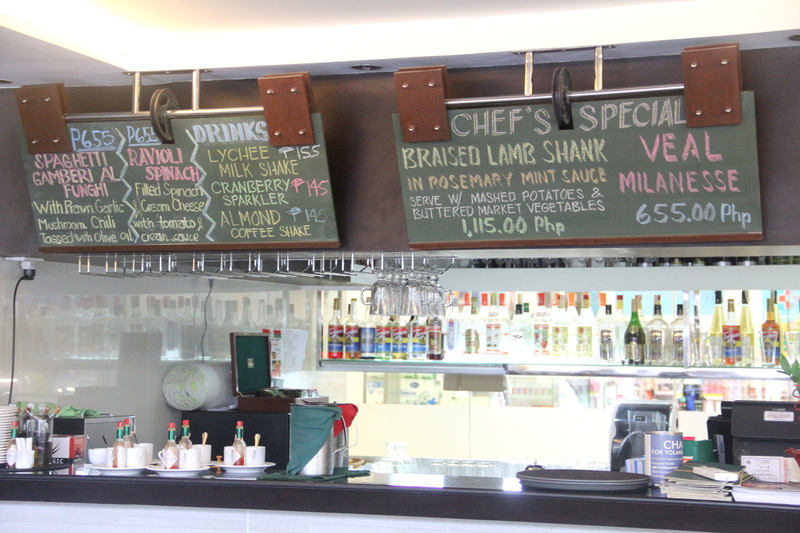 Fratini's serves Italian cuisine and is conveniently located at the ground floor of SM Jazz, just beside the entrance. The place has chic interiors and a very homey vibe. 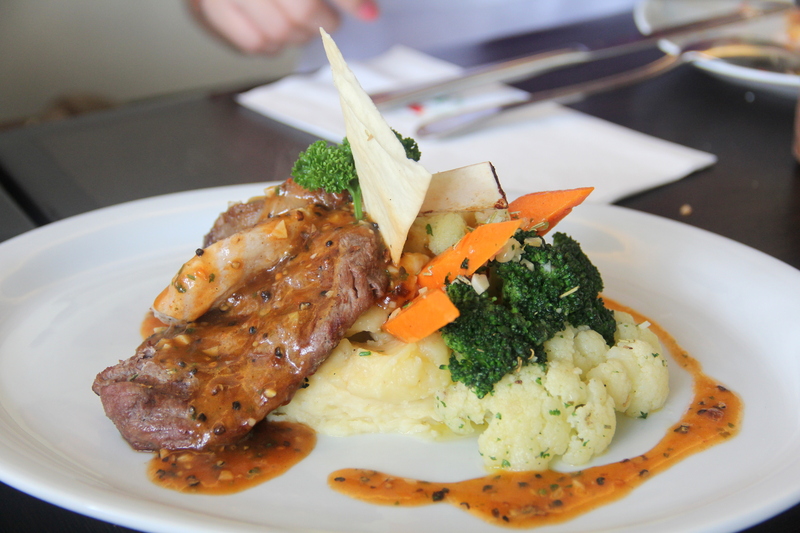 I, along with some other bloggers, got the chance to try some of their sumptuous dishes. 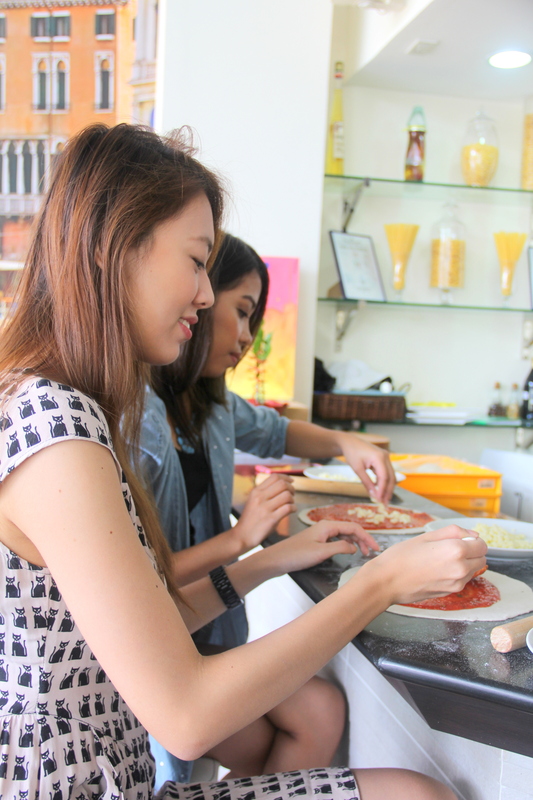 As if that wasn't enough, we were also taught how to make our very own pizzas (highlight of my day lol)! Read about my review after the break. 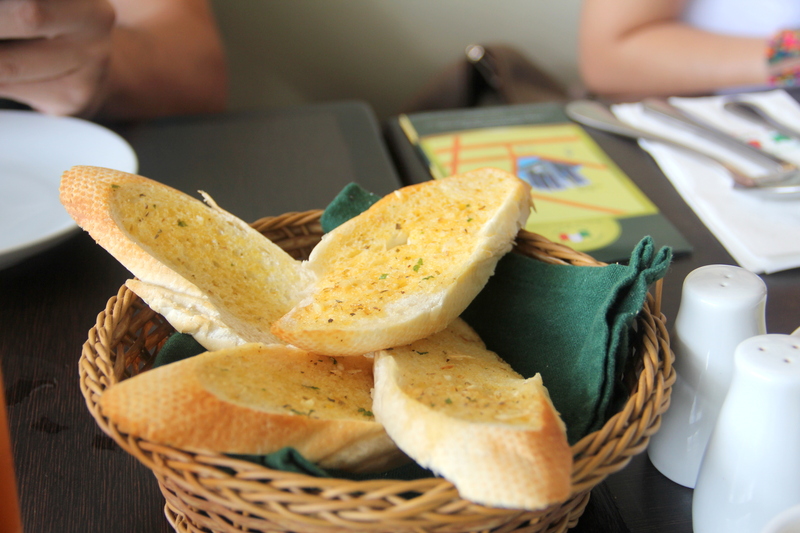 Panne All Aglio / Garlic Bread with Balsamic and Olive Oil: The bread was tasty and chewy, just the way I like it! I actually ate a lot of this while waiting for the appetizer sampler! 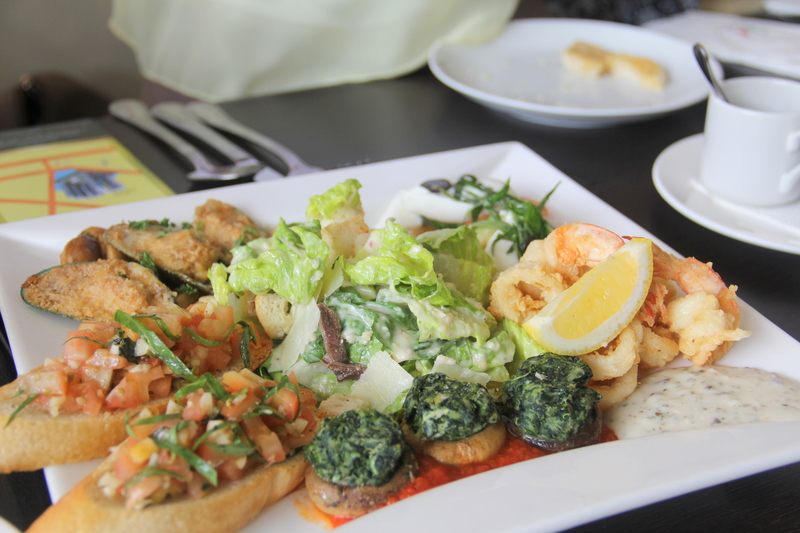 Counterclockwise: Tomato Bruschetta, Stuffed Mushroom, Crispy Prawns, Cheese and Zucchini Salad, Mussels Gratin. The one in the middle is Caesar Salad. The Bruschetta tasted very refreshing because of the tomatoes, and the Caesar Salad was amazingly good! The stuffed mushrooms were also really yummy. I wasn't able to try everything because the plates were emptied as soon as it got served lol. But so far, everything I tried tasted pretty good. 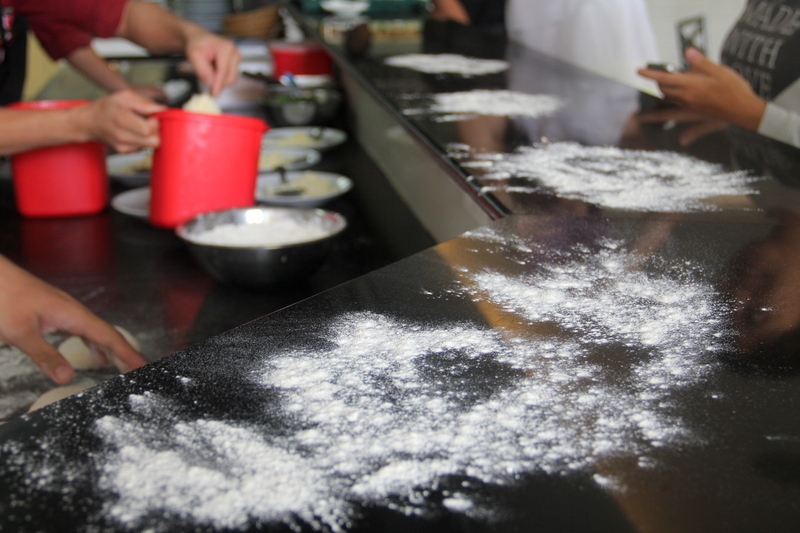 We were caught off-guard when some staff asked us if we wanted to get our hands dirty and make some pizza. Of course, we said yes! The first step was to sprinkle flour on the tabletop. 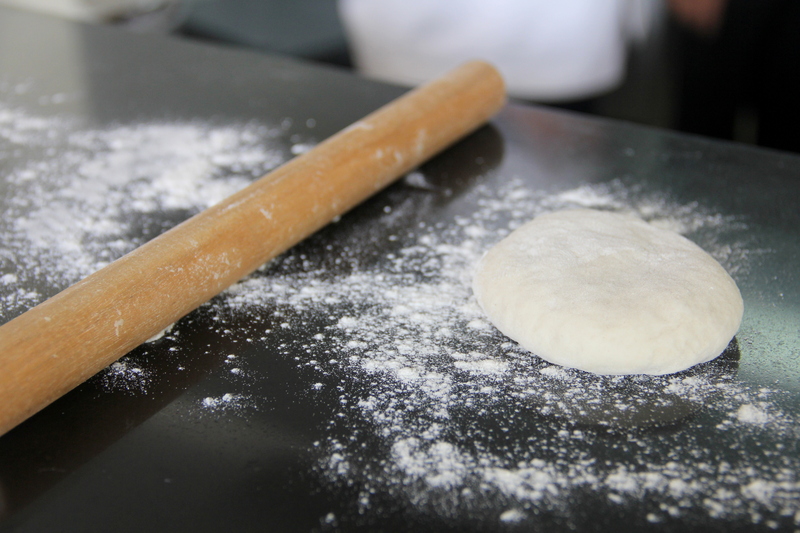 Then we flattened and shaped the dough using a rolling pin. It was such a challenge to get the perfect round shape! I wonder how the chefs do it? Probably through tons of experience! I don't like pizzas with a lot of toppings so I made a simple shrimp and garlic pizza. I used cheese, shrimps, garlic, bell pepper, and a slice of onion. I don't like onions, so this one was just for aesthetic purposes lol. Then I placed the pizza on this pizza shovel, which would help me place the pizza inside the oven. It wasn't as easy as it looks! Plus, it was really heavy so I had to use both my hands. Once it was cooked, I added basil leaves on top. This was such a fun and rewarding experience for me! 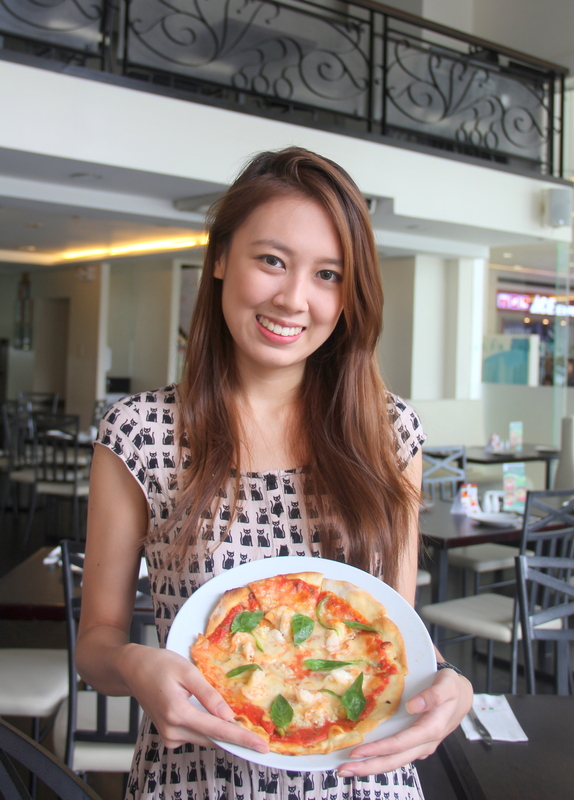 If you want to try making your own pizza, you can avail it for P225. This comes with 3 toppings of your choice. Not to worry, because the pizza chefs will be there to guide you every step of the way! With the other bloggers at the food tasting event! What's unique about this Supreme Pizza is that it's composed of 2 different flavors. 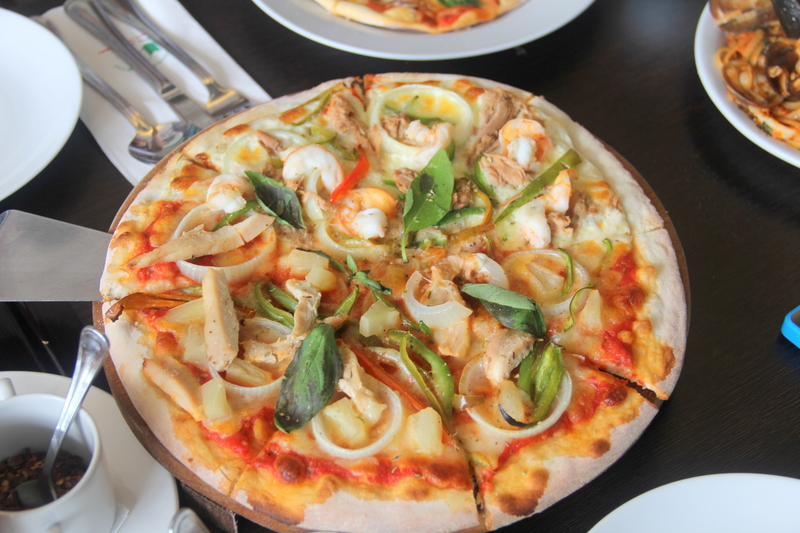 The half is topped with cream sauce, mozzarella cheese, tuna, prawn tails, onion, chili, and bell pepper, while the other half is topped with tomato sauce, mozzarella cheese, chicken breast, onion, bell pepper, and pineapple. What I liked the most about Fratini's pizzas is their crust. 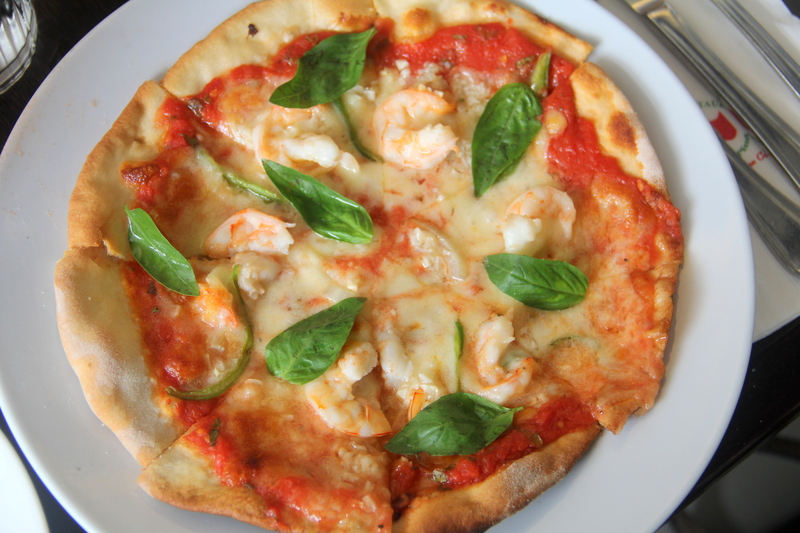 The supreme pizza was delicious, but I still prefer the shrimp & garlic pizza I made. Probably because it had all the toppings I liked lol. I suggest you try making your own pizza! 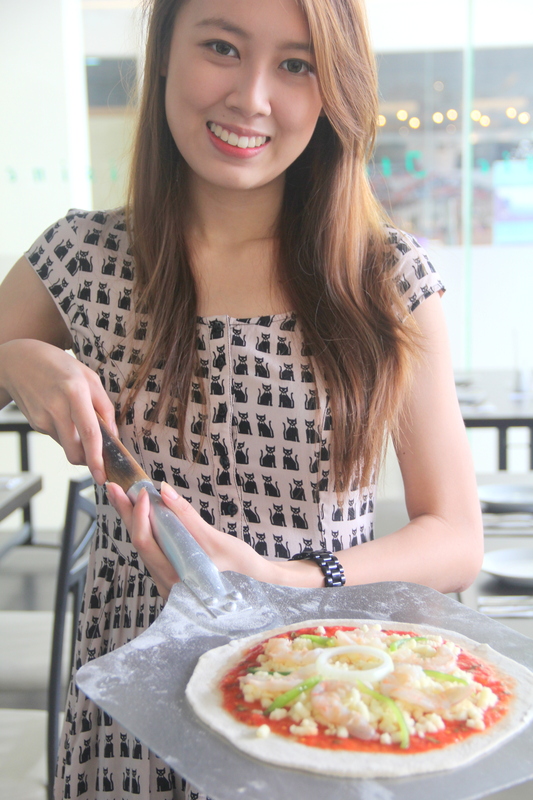 Aside from having a pizza tailor-fit to your liking, you also get to create it with your own hands. Trust me, it's a great experience! This can also be a great activity for kids! Pasta Trio: Linguini ai Frutti di Mare, Fettuccine Carbonara, and Spaghetti alla Pugliese: This contains tomato-based, cream-based, and oil-based pasta in one dish! Talk about genius! 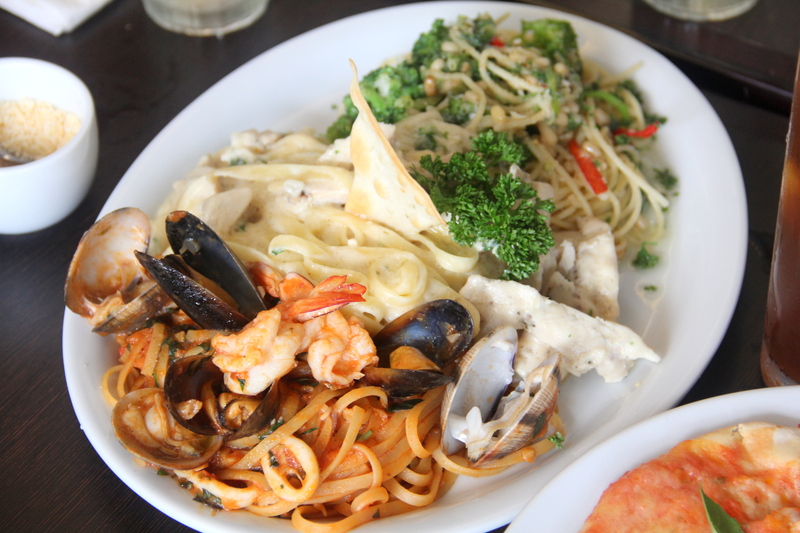 The Carbonara and the Spaghetti alla Pugliese tasted okay, but the Frutti di Mare was absolutely heavenly! The seafood flavor was seemingly infused in the pasta. This dish is highly recommended! Mixed Grilled Meat: Lamb, Tenderloin, and Chicken Breast in Black Pepper Sauce served with Mashed Potatoes and Sautéed Market Vegetables: I wasn't able to taste all of them but the tenderloin wasn't as tender as I had hoped. I suggest you stick with the pizza and pasta! Classico del Pudding di Choco: Home-made chocolate pudding. 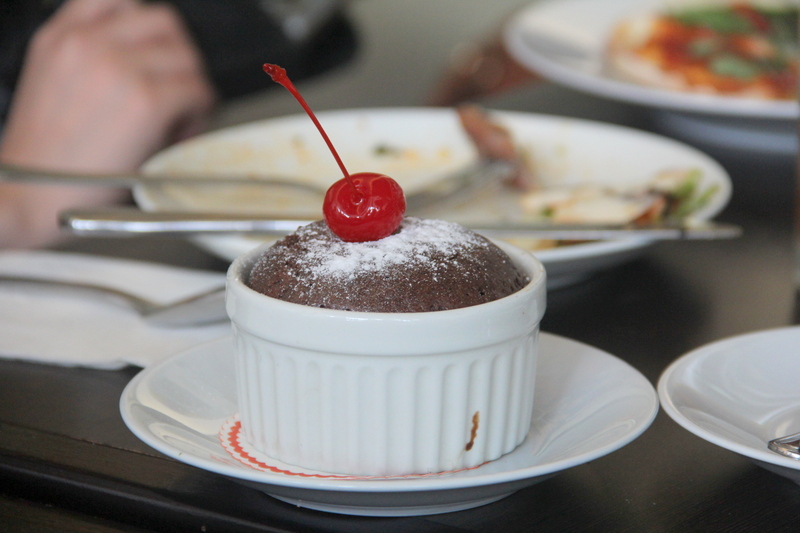 Imagine a lava cake with gooey chocolate filling inside. 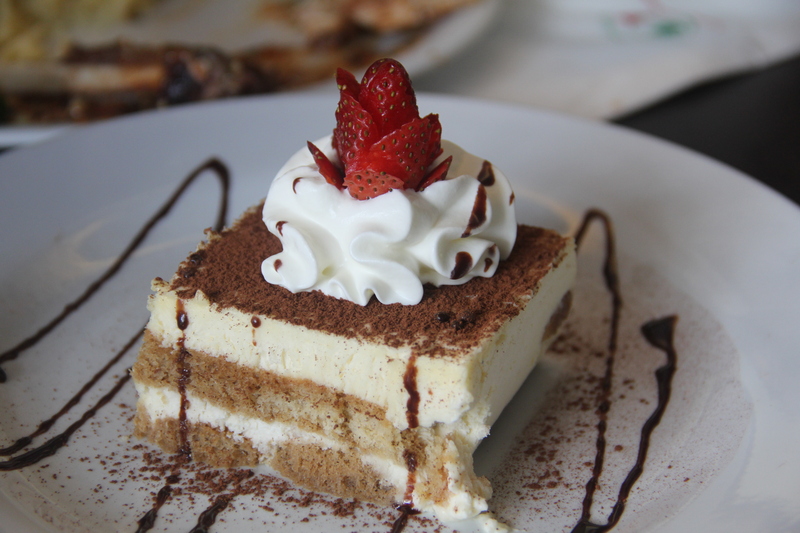 Tiramisu Tradizionale: If you're into coffee and don't like desserts that are too sweet, this is for you! 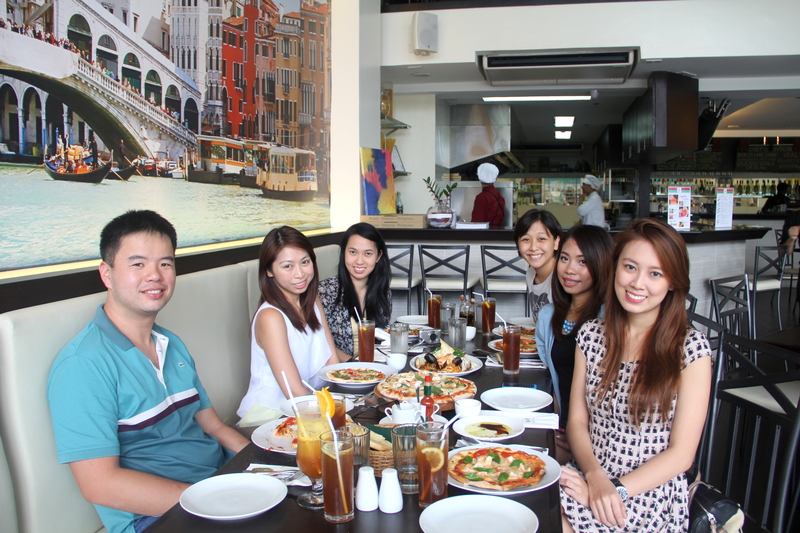 Overall, I enjoyed my dining experience at Fratini's. 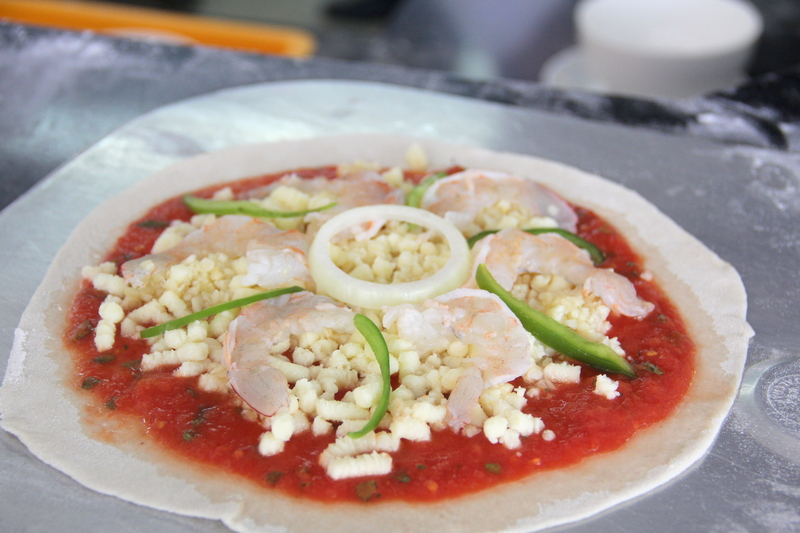 I especially loved the chewy pizza crust and the flavorful Frutti di Mare Pasta. Have you tried eating at this restaurant? Tell me about your experience by leaving a comment! Fratini's is located at SM Jazz, Jupiter St., cor. Nicanor Garcia St., Makati City.